Cycling accidents injure or kill thousands in the United States every year. Many motor vehicle drivers foster a misconception that bicyclists don’t belong in public roadways, which is simply untrue. Legally, cyclists have the same right to use the public roads as motor vehicles. Too often, motor vehicles don’t know, or don’t follow, these rules. And unfortunately, this bias often follows cyclists through the personal injury legal system. If you were injured in a bicycle accident, you have every right to seek compensation from those responsible for your accident. You need the right lawyer to succeed. According to the Centers for Disease Control (CDC), there were 467,000 bicycle-related injuries in 2015, resulting in lifetime medical costs and productivity losses of $10 billion. In 2016, there were 840 cyclist fatalities in the U.S.
71% of these fatal bicycle crashes occurred in urban areas, where traffic is the heaviest, and slightly more crashes occurred during the daylight. Most bicycle fatalities happen during the evening rush hour, between 6 p.m. to 8:59 p.m.
Motor vehicle accidents cause 90% of bicycle fatalities, and are the most likely to result in catastrophic injury, simply because they are larger, heavier, and faster than a bicycle. Additionally, cyclists do not have as much protection as someone inside a car. A motor vehicle cuts off a bicyclist when entering the roadway. A motor vehicle makes a right turn and cuts off a cyclist traveling straight in the bike lane. A motor vehicle rear-ends a cyclist trying to maneuver around a car parked in the bike lane. A driver of a parked car, truck or van opens a door in the path of a bicyclist. The cyclist is riding on the wrong side of the road, against oncoming traffic. A motorist or a cyclist runs a stop light or stop sign. The cyclist makes an unpredictable or hazardous move. A cyclist falls off the bike due to a poorly-maintained roadway. The bicycle is defective, damaged, or poorly repaired. A cyclist falls off the bike due to an animal attack. A cyclist collides with a pedestrian or another cyclist. A cyclist falls off the bike due to loss of balance or inebriation. Put a Lid on It! Wearing a helmet is the single most effective way to prevent head injury as a result of a bike crash. 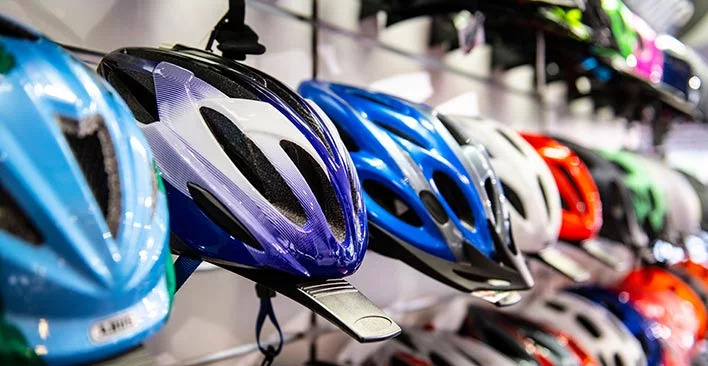 The Journal of the American Medical Association estimates that wearing a helmet when cycling reduces the risk of head injury by 50 percent, and the risk of injury to the head, face, or neck by 33 percent. Make a Spectacle of Yourself: Many bicycle accidents with motor vehicles occur because the driver simply didn’t see the bike. Increase your visibility with lights on the front and back of your bicycle, as well as reflectors on the bicycle frame, tires, and pedals. Wear brightly colored or reflective clothing anytime you’re riding on the road, and especially if you are riding at night. Don’t Drink and Drive — or Cycle: In 2016, 22% of fatal bicycle crashes involved intoxication, either on the part of the driver or the cyclist. Drunk cyclists experience all the same impairments that drunk drivers do, including changes in vision, reaction time, depth perception, and judgment. Drunk cycling, while not typically taken as seriously as drunk driving, is a criminal offense. Liability for a bicycle accident injury depends on the accident cause, and who was at fault. If the driver of motor vehicle caused the accident, the cyclist may file a claim against the driver or the driver’s auto insurance company. 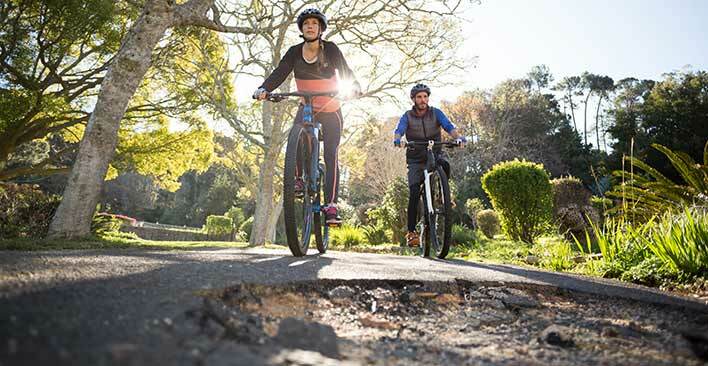 If the road was in poor repair or the bicyclist fell because of debris, the cyclist may file a claim against the government agencies responsible for designing or maintaining the road. If a bicycle was poorly designed or repaired, the cyclist can file claim against the people responsible for manufacturing or repairing the bicycle for any accidents that occur because of their negligence. If a dog jumped at a cyclist and caused an injury, the cyclist can file claim against the dog’s owner. If a pedestrian or another cyclist caused an accident by violating the injured cyclist’s right-of-way, the cyclist can file claim against them. If a cyclist is at fault for an accident, he or she will be unable to collect any damages in the personal injury legal system. In fact, they might have to pay damages for any injuries they caused to the driver or other parties involved. 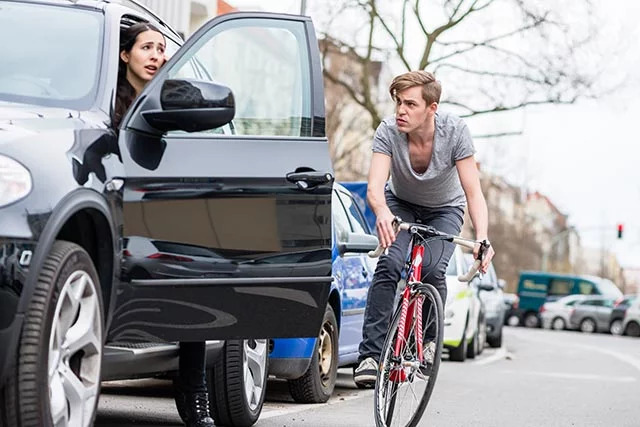 If both the bicyclist and the driver (or pedestrian or other cyclist) shared fault, he or she may receive damages at a diminished rate according to the rules of comparative negligence. Although the precise rules vary from state to state, the cyclist may receive damages reduced to the degree to which s/he was at fault. For instance, if you were in a bicycle accident with a car, and the court determines that the motorist was 80% responsible for the accident, and you were 20% responsible. You will receive 80% of the damages to which you would have otherwise received. Drivers must show a greater duty of care (sometimes known as “unusual care”) when child cyclists are present, or when driving in areas in which children are likely to be found, such as schools or playgrounds — even if they do not see any children in the immediate vicinity! The law recognizes that what “reasonable care” means to an adult might not necessarily constitute reasonable care to a child. The law holds children to a lower standard of conduct in a bicycle accident case, because they are not as capable as adults are of making responsible decisions. At what age is a child legally expected to exercise care for their own safety? Generally, children under the age of four are not recognized as having the ability to be negligent. Older teenagers have greater legal responsibility. Laws are open to the court’s interpretation for children older than four but younger than fourteen. So, is a driver automatically at fault in any accident involving a child cyclist? Not necessarily, for instance, if the driver could not reasonably have avoided an accident. However, the law weighs heavily on the side of child cyclists. In a bicycle accident lawsuit, just as in any other type of lawsuit, you, the plaintiff, will have to prove by a preponderance of the evidence that it’s more likely than not that the defendant (the person who caused you the injury) was negligent. Negligence in the personal injury legal system has four elements: duty, breach, harm, and causation. You must prove that the defendant had a duty to you (such as the duty to drive safely and with care for nearby cyclists), that they breached this duty, that you suffered some harm (such as an injury or damaged property), and that this harm was caused directly by the other driver’s breach of duty. In some cases, it is enough for the plaintiff to prove that the defendant violated a traffic law (such as running a red light), and that this violation led to the plaintiff’s injuries. This legal standard is known as negligence per se. Punitive damages, which a judge or jury may award to punish an especially egregious offender, for example street racers, or drunk drivers. Of course, the types of damages you collect will depend on the nature of your case and the quality of your legal representation. Does Auto Insurance Cover Cyclists? Typically, automobile insurance covers cycling accidents. If the accident was the automobile driver’s fault, the driver’s auto insurance will cover your injuries. If you have personal injury protection coverage, you may also be eligible to receive damages from your own auto insurance. This is true even if you were riding a bicycle, as opposed to driving a car, at the time of the accident. Your own medical insurance will also help cover damages for your injuries, but afterwards may seek reimbursement from the responsible driver’s auto insurance behind the scenes, through inter-insurance arbitration. A minority of states, including New York, are no-fault insurance states. In these states, insurance companies are required to pay medical bills whenever anyone was injured in a crash, irrespective of who was at fault. If you have no-fault coverage in New York, then you may be eligible to collect damages up to the required legal limit. Make sure you are safe. If you are in the middle of a road or a bike path, move to the side, and out of the way of cars or other bicycles. Call 911 to summon the police and emergency medical personnel, even if you don’t think you’re severely injured. The adrenaline rush after an accident can hide injuries, and some common types of accident injuries frequently have delayed symptoms. If the accident was with another vehicle or a pedestrian, you should exchange information, including name, contact, license, and insurance information. Try to not react with anger, but don’t apologize or say anything that can be taken as an admission of fault. Don’t say, “I’m OK,” or “I should have been more careful.” Just be polite and businesslike. Do not negotiate or agree to a settlement with the other driver. If the other vehicle flees the scene, try to get the most detailed description of the vehicle possible, including make, model, color, license plate, description of driver, and any damage, and report it to the police. When the police come, make sure you report your version of events, and take the officer’s name, badge number and police report number. You can use this information to order your free copy of the police report later. Collect evidence, if you are able to do so. Record the names and contact information of any witnesses. Take photographs or video of your injuries, damages, and the accident scene. If there is damage to you bicycle, helmet, or clothing, leave these as they are and don’t attempt to fix or clean them. As soon as possible, write down some notes about how the accident happened, and where you and the car were situated at the time. Is there is road damage, obstructions, or debris in the road, bike path, or far-right lane? Is the road signage confusing or missing? Take photographs and notes. Even if you don’t go to a hospital immediately, be sure to see a doctor soon after your accident. This is important both for your health and for your case; medical bills and records are the backbone of a personal injury lawsuit. Keep detailed records of all your losses after an accident, including lost wages and bills for damaged property, and even the less tangible ways in which your injuries interfere with your everyday life (i.e. non-economic damages). Do not talk to the at-fault party’s insurance company, or lawyers representing them. Don’t accept any offer before having a lawyer review the case. Hire an experienced bicycle accident attorney, and leave the advocacy and legal wrangling to your lawyer. A legal firm that knows the personal injury system, and has experience negotiating with insurance companies will help you receive a much larger amount of compensation than you would otherwise. More importantly, they will take the burden off your shoulders so you can focus full-time on recovering from your injuries. TorkLaw‘s attorneys have extensive experience in dealing with bicycle accidents. Call us today for a FREE consultation! 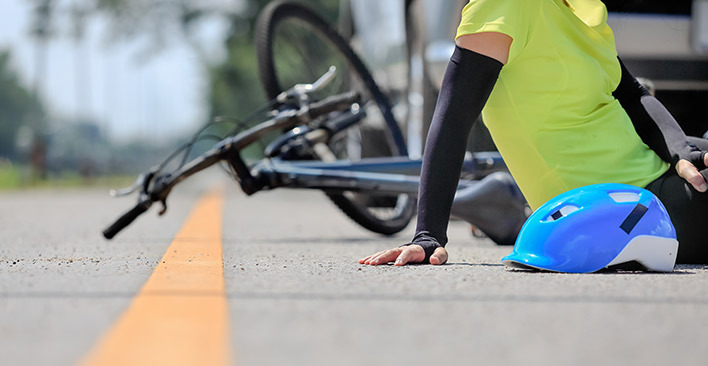 For more information on bicycle accidents, check out Reza Torkzadeh’s book, Accidents Happen: A Consumer’s Guide to the Personal Injury and Wrongful Death System. The book has an entire chapter on bicycle accidents, and if you live in an area where we practice, we will send you a free copy.